FELA! Haitians in South Florida Are Loving It! From what I am hearing, FELA! is a must see... Some Haitians who saw the Broadway Musical are just amazed by it. The music... the dancing... the drumbeats, it is so close to home... So close to the Haitian rhythm. To see all that African flavor in a Broadway Musical, its truly worth every penny. To actually see a Haitian dancer be a part of it, that's priceless! 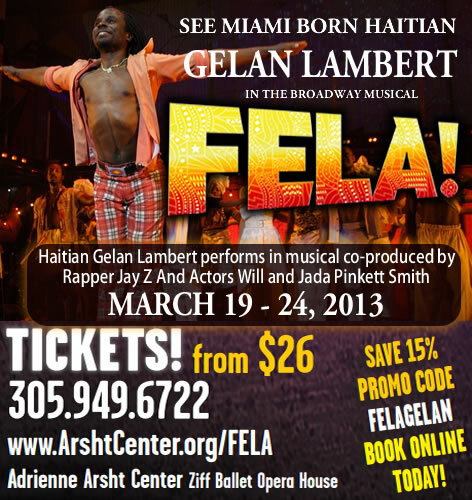 If you live in South Florida, you have a rare opportunity to see Haitian dancer Gelan Lambert live in this Broadway musical FELA! from a team of producers including Jay-Z, Will Smith and Jada Pinkett Smith. Fela! runs through March 24th at The Adrienne Arsht Center in Miami. Take a load off... Go See it... You will thank me for it!